File Name: Eric W. Freistadt, of Chicago, Illinois. Notes: Chicago is in the state's northeast corner, at the south end of Lake Michigan. Bullet-Proof, Ghostrider, Hardtop, Heavy Duty, Scoop, and Static Line are also from Chicago. When the original figure was later available by mail in 1986, his first name was changed to Mark. There are red-back filecards, presumably from later mail offers, that give the file name as Mark W. Brenstan. All other versions, as well as comic book resources, stay with the original name. Notes: Short-Fuze wore his 1982 outfit, with dark grey helmet, blue-tinted visor, and black belt. Accessories: black M19 60mm light mortar with two-legged stand (new), dark olive simple battle helmet wider on brim and sides (new), clear visor that fits onto helmet (new), dark olive squarish backpack with engraved mortar shells (new). Short-fuze comes from military family (Father and Grandfather both career Top Sergeants). Enjoys abstract mathematics and can plot artillery azimuths and triangulations in his head. Specialized Education: Artillery School; Engineer School; Advanced Infantry Training. Qualified Expert: M-14; M-16; M-1911A1; M-79 (Grenade Launcher); M-2 (60mm Light Mortar); M-1 (81mm Medium Mortar). "Short-Fuze is logical and sensitive. Has a tendency to blow his stack - hence the nick-name...Short-Fuze." Variations: Re-tooled in 1983 to accommodate swivel-arm battle grip and a new waistpiece design. 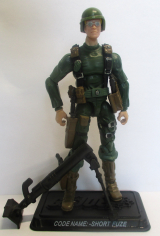 Yojoe.com lists swivel-arm Short-Fuze as version 1.5. There are three accessory variations based on the size and shape of the handle on Short-Fuze's mortar. 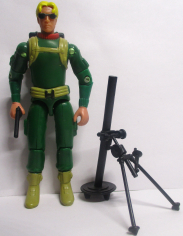 The prototype in the 1982 catalog has a Grunt backpack, a solid black visor, and an olive green mortar, as well as more intricate facial features. Reissues: The straight-arm variant was reissued in fall 1982 in a J.C. Penney three-pack with Breaker and Zap. 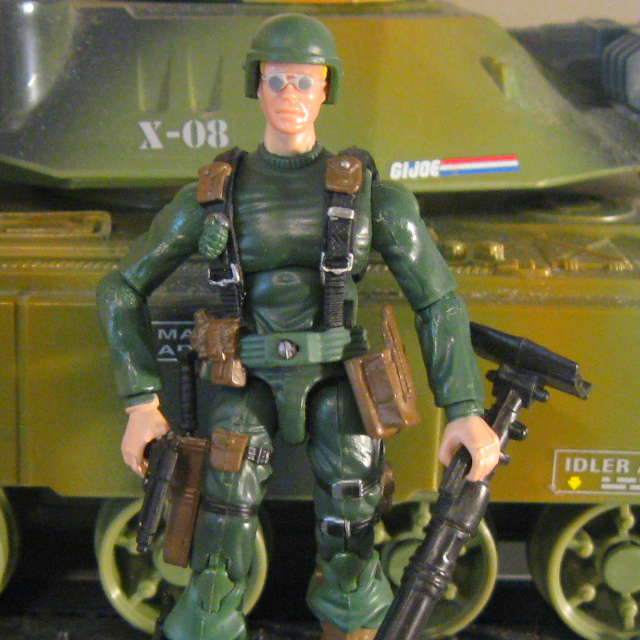 The swivel-arm variant was reissued in mail offers 1985-1986 (Get Your Gear, Operation Freedom Has Begun 85 and 86). Accessories: plain green bazooka (82 Zap's), black mortar with stand (82 Short-Fuze's), plain green helmet (82 Short-Fuze's, undersized), clear visor (82 Short-Fuze's), black backpack with green shells (82 Short-Fuze's). Short-Fuse was chosen from the top of his class, to join the G.I. Joe team at its inception. He comes from a traditional military family - all career soldiers. His artillery experience and expertise helped the JOES win many battles. He can actually plot artillery azimuths and triangulations in his head. His love for abstract mathematics makes him somewhat of a nerd, however, no one would dare tease him. It seems he's quite sensitive about it and can lose his temper very quickly, hence his code name...Short-Fuse continued his regular military service until he received word about the original G.I. Joe team re-organizing its members; he returned with full support. After the team's first encounter with COBRA forces, they found a suitable location and in the tradition of the men and women who served their country before them, raised the flag in their honor, and declared - STARS and STRIPES FOREVER! From General Hawk's Files: "In all my days, I've never seen a guy remember the information he does. Short-Fuse can plot artillery triangulations in his head, faster than someone with a compass. He pinpoints targets with over ninety-five percent accuracy and provides the team with a huge advantage. The one thing you don't want to do around him is mock his gift of intelligence. The guy's temper flares up mighty quick, and everyone best stand back to let him cool down. He loves his job and can be counted on to lend the support we need." Motto: "Make me mad, and I'll get more than even." Toy Notes: Boxed in a Toys 'R Us-exclusive set with the Stars and Stripes Forever flag base, Breaker, Grunt, Rock 'n Roll, Scarlett, Snake-Eyes, Stalker, and Sgt. Zap Item #28020. Accessories: black pistol (85 Tomax's), black machine gun (91 Big Ben's). SHORT-FUZE was chosen from the top of his class to join the G.I. JOE team at its inception. He comes from a traditional military family - all career soldiers. His artillery experience and expertise helped the G.I. JOE team win many battles. He can actually plot artillery azimuths and triangulations in his head. His love for abstract mathematics makes him somewhat of a nerd. However, no one would dare tease him. It seems he's quite sensitive about it and can lose his temper very quickly, hence his code name. "I can pinpoint targets with over ninety-five percent accuracy so that we give COBRA forces a real incentive to turn tail and run if they know what's good for them." Toy Notes: Carded in a Toys 'R Us-exclusive set with Flint, Action Man, Tunnel Rat, Roadblock, and Beachhead. Item #50802. Accessories: black pistol (03 Beachhead's), black mortar with stand (03 Iron Grenadier's), black backpack (01 Double Blast's). SHORT-FUZE was chosen from the top of his class to join the G.I. JOE Team at its inception. He comes from a traditional military family - all career soldiers. His artillery experience and expertise helped the G.I. JOE Team win many battles. He can actually plot artillery azimuths and triangulations in his head. His love for abstract mathematics makes him somewhat of a nerd, however, no one would dare tease him. It seems he's quite sensitive about it and can lose his temper very quickly, hence his code name. Toy Notes: Carded in a three-pack with Flash, Rock 'n Roll, and a reprint of Marvel #8. Item #60892. Accessories: black rifle (83 Snow Job's), black crossbow (82 Scarlett's), black pair of ice shoes (88 Blizzard's), black backpack (92 Gung-Ho's). Toy Notes: Carded in a Toys 'R Us-exclusive set with Frostbite, Sgt. Stalker, Backblast, Snake Eyes, and Mirage. Item #07253. Accessories: two black pistols (07 Snake Eyes's), black mortar with stand (82 Short-Fuze's), black knife with silver blade (07 Snake Eyes's), dark green helmet (05 Breaker's), black webgear with brown pockets and green belt and grenade (07 Snake Eyes's), black Joe figure stand. SHORT-FUZE comes from military family; his father and grandfather were both career Top Sergeants. He enjoys abstract mathematics and can actually plot artillery azimuths and triangulations in his head. He's logical and sensitive; he has a tendency to blow his stack, which accounts for his code name. Specialized Education includes Artillery School, Engineer School, and Advanced Infantry Training. Qualified Expert: M14 rifle, M16 rifle, M1911A1 pistol, M79 grenade launcher, M2 mortar, and M1 mortar. Toy Notes: Boxed in a Target-exclusive set with Cobra H.I.S.S. Driver, Cobra Vehicle Gunner, Destro, Cobra Commander, Steeler Sgt. Stalker, a dark green M.O.B.A.T., a blue Flight Pod, and a red H.I.S.S. Tank. Item #34106.